A representative from <mobile website provider> contacted me about creating a smartphone app for my business page. They offered to waive the sign-up fee, and drop the rate to $29.95/mo. 1) Is this type of service really necessary? 2) Is <mobile website provider> the company to go with? and 3) Is this a good value? There is nothing that pisses me off more than companies who prey on small business owners. Let’s face it, we can’t know everything. There’s marketing, accounting, taxes, health codes, business regulations, and all of the basic skills of our jobs. So, it’s not unreasonable that most small business owners, like massage therapists, may not be experts at websites and online marketing. Fortunately for you, I am kind of an expert at web design and online marketing. It’s one of the reasons I started a web design business – to keep my massage therapist friends from getting ripped off by companies like our mobile website provider. Right now, probably half of your clients are surfing the web using a smart phone instead of a computer. The percentage of mobile users has been growing steadily for years and there isn’t any sign that it’s reached its limit, yet. So a mobile friendly website is not only important, it’s downright necessary. But that doesn’t mean you have to pay for a special service that will provide a mobile website for you. Right now. Without a lot of technical know how. All it takes is a “Responsive” theme. What is a responsive theme? A responsive theme is simply a website that changes its design and layout as the viewing screen changes. On a laptop/desktop/big tablet, the navigation is going to look like your classic website navigation with all of the items sitting side-by-side. But if the website is viewed on a smartphone, the navigation becomes a drop-down menu. It takes up less space so the font size (lettering size) can be large enough to read clearly on the phone screen. On the smartphone, certain sidebar elements might not appear or they might rearrange themselves so that everything is scrollable and readable without zooming. The design “Responds” to the size of the device used. Here is a side-by-side comparison of the same website*. On the left, you’ll see what the site looks like on my laptop. On the right, you’ll see what it looks like on my iPhone. See how things are rearranged? The site is very readable without my having to zoom in on the iPhone screen. There is nothing this company, or any of their competition, is offering that can’t be done with a well designed website. Even the default WordPress theme, TwentyTwelve, is responsive, and TwentyTwelve is FREE. Go to ThemeForest or ElegantThemes and you’ll see dozens of themes that are responsive and the cost is less than $50. That’s less than 2 months of the service being pitched to nice, hard working people like you. So save yourself a lot of money and hassle and skip the slick sales pitch of <mobile website provider>. Get yourself a nice WordPress website with a responsive theme. Spend that saved money on something nice for yourself like a table warmer or some nice massage music. Want to learn how to design your own website using WordPress? I’m putting together an online class to teach you how to do this yourself. Drop me a line in the comments if you would be interested. Want a great website but don’t want to hassle with designing it yourself? I can help you with that, too. Head over to Pint Sized Sites and shoot me a message. I’d love to help you out. You’ll see more posts in the future on how to use WordPress as your website. It’s one of the best tools out there. Is this site responsive? Not yet, but I’m working on it. Expect to see a big design change in the next month. * Using Headway is a site I just designed using, well, Headway. Google Analytics part 2 – What does all that data mean? In Part 1 of our Google Analytics series, I showed you how to add the Analytics code to your website. In this post, I’ll show you what data gets collected and help you figure out what it’s telling you about your website. Let’s take a look at the “Standard Reporting” for my brand new website. This site hasn’t launched yet, so the only traffic we’ll see is the one or two times I’ve visited it while adding the Analytics code. On the left side of the page, you’ll see a menu where we can drill down on all of the different data available. Audience – who is visiting our site. Behavior – are they new here or returning visitors. Technology – what browsers are they using, what network are they on? That great big graph on the top is the number of VISITS in the last month. You can change it to hourly, daily, weekly or monthly. You can even change the time frame and compare it to a previous time period. As you can see, my new site has only 2 visits today. Below this big graph, you’ll see a bunch of smaller graphs and a pie chart. 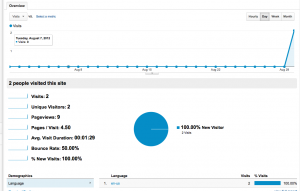 That pie chart tells you how many of your visitors were new vs. returning. 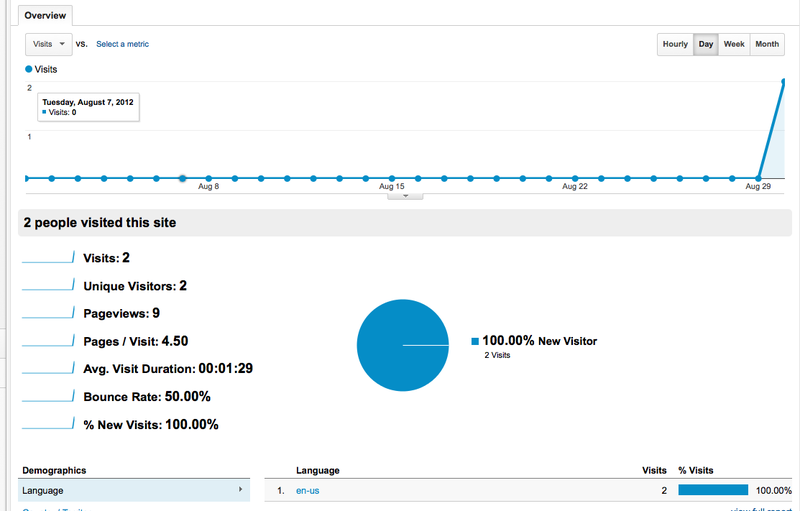 Click on any one of those little graphs and it will take the place of the Visits chart so you can see the data better. Visits – this is how many times someone has navigated to any of the pages on your website that have the tracking code installed. Unique Visitors – If someone visits twice, they will only be counted as one unique visitor. Pageviews – how many total pages have been viewed. If a page is viewed more than once, it gets counted each time someone looks at it. Pages/Visit – when someone comes to your site, how many pages do they look at? Average visit duration – how long does someone linger on your site? If it’s a few seconds, you know that they didn’t find what they were looking for. Bounce Rate – this is always fun to explain: it is the percentage of visitors who visit your site and “bounce” (leave the site) instead of staying to view other pages. In Part 3, we’ll look at a real example and talk about some strategies we might take. In the meantime, if you have questions about Analytics – ask them below.